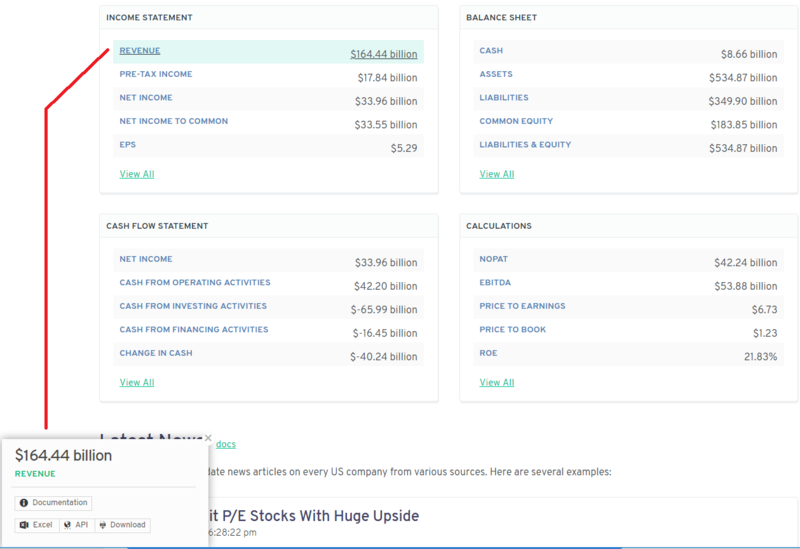 Intrinio's Data Explorer has a webpage on each of the companies, securities, and stocks that Intrinio covers. Each page includes basic information like financials, stock prices, and news. You can see Amazon's page here to get a feel for what each page looks like. This article explains how to take advantage of the Data Explorer to search Intrinio's coverage, get an overview of a stock, or pull the data you see on a page. Typically, Intrinio users want to get data for a specific company or list of companies. Developers might use the Security Master to search all of Intrinio's coverage automatically via REST API, but, for many users, it can be easier to just search for a company in a web app. The Data Explorer provides that search functionality. Start by clicking either companies, which refers to United States based stocks, or Securities, which refers to stocks and other investment vehicles from around the world. Securities includes all investments in Intrinio's coverage; Companies is primarily US-based stocks. Once you pick a category, you can search for by ticker, company name, or security identifier and explore by categories. The coverage is sorted into categories by factors such as sector, industry, market cap, and country. When searching US companies, you might notice that you can search with a simple ticker symbol or company name like "AT&T." When searching securities, you'll see that each ticker symbol is paired with an exchange. This is to help distinguish securities across borders. 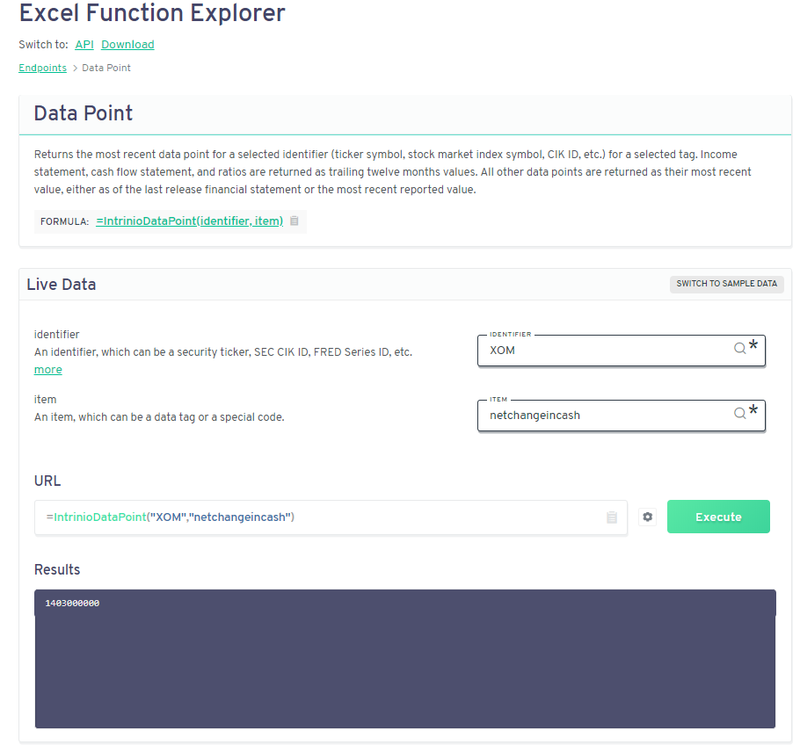 If you are looking for a quick way to search Intrinio's coverage for a specific security, the Data Explorer is an easy solution. The Data Explorer provides the latest news and company financials. You can see the most recent stock prices, dividends, volume, and dividend pay date, as well as metrics like short interest, days to cover, and beta. For US companies, it's possible to dig in even further to see company financials such as revenue, EPS, ROE, and EBITDA. You can also see the latest headlines for a stock. If you see data on a page and want to access it via API, Excel, or CSV, the Data Explorer makes it easy to pull the most recent or historical time series data. Just click the green icon next to any data point, and you'll see a pop up showing how to access the data. Once you have seen the access methods, you can click any of them to launch the API explorer which shows how to pull the data. In this example, you can see the syntax for pulling Exxon Mobil's net change in cash in Excel. If you have the Excel add-in installed, you can just copy and paste the syntax to pull in the data. Clicking any of the other access methods will launch the API Explorer as well, making it easy to pull the data you want from the Data Explorer any way you'd like. That was a whirlwind explanation of the Data Explorer. You can always chat our team if you have questions.